Well, I've pretty much finished my painting on the pastelboard. I was rather surprised to have to say, that I really like the board as a painting surface. When I first ran my fingers over the board, it didn't feel anything like the LaCarte which I'm most comfortable with. However, it blends very nicely, especially when you've got a good bit of pastel down and unlike the LaCarte, it won't evaporate if it gets wet. For me, that is one of the only reasons why I was looking for a substitute for the LaCarte, that and I like to frame without mats, and it would me much easier on a sturdier support. I have a catahoula service dog who is by my side 24/7 and if he shakes his head and drools lands on the paper, or I sneeze, there are now spots on the card that pastel won't cover. I guess it has something to do with the vegetable fibers or something, but it makes the paper very touchy to say the least. But so far, LaCarte is the only paper that allows you to "push" the various colors of pastel around on the paper until you get a blending that you like, at least that I've found. You can most certainly finger blend the ampersand very nicely, it just doesn't have the ability to "shift" the color around like the LaCarte. It is definitely as close as I've found to this point. I am going to try the Uart sanded paper next, and I'll post my results as soon as I'm done. 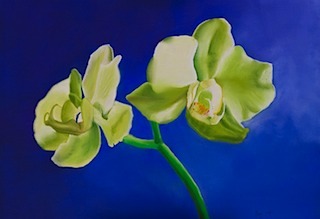 I'm planning to frame the orchid painting today, and I'll also post my results with that. The painting is entitled "Duet" (thanks to Donna T for help with the title). It is 9"x12" on Ampersand Pastelboard and done with Sennelier, Mt Vision and NuPastel.